America’s failure to clearly back Britain in its current diplomatic row with Argentina over the Falkland Islands risks sending the wrong message to U.S. allies in Asia. With the world’s attention focused on Bashar al-Assad’s violent suppression of the Syrian civilian uprising, and with the increasing likelihood of a strike by Israel to thwart Iran’s relentless drive to obtain nuclear weapons, perhaps the most underreported international story is the increasingly heated dispute between Britain and Argentina in the South Atlantic Ocean. It is an unfolding issue that could say much about the way the U.S. handles its alliances, including those in the Asia-Pacific region. Thirty years ago, on April 2, 1982, Argentina invaded the Falkland. British Prime Minister Margaret Thatcher quickly assembled and dispatched a formidable naval task force to retake the islands, which had been a British possession since 1833. On June 14, Argentine forces surrendered to the Royal Marines. The conflict was brief and violent, with both nations losing ships and hundreds of sailors and soldiers. The war was, however, a decisive victory for the United Kingdom. Argentina’s Foreign Minister, Hector Timerman, claims that Cameron’s defense of the Falklands sovereignty “is perhaps the last refuge of a declining power.” Prince William aka Flight Lieutenant Wales, who is currently piloting a Royal Air Force rescue helicopter in the Falklands, has been labeled a “conquistador” by Argentine officials. 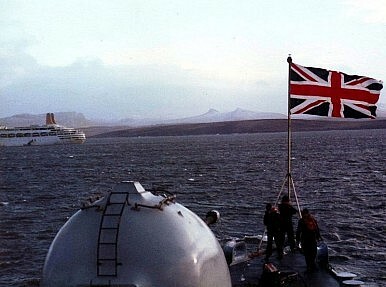 In a diplomatic offensive, Kirchner persuaded Argentina’s partners in the Mercosur trade block – Brazil, Paraguay and Uruguay – to ban civilian ships flying the Falklands’ flag from entering their ports. Mercosur members had previously banned British warships on Falklands duty from their ports. In December, the 33-country Community of Latin American and Caribbean States unanimously backed Argentina’s “legitimate rights in the sovereignty dispute” over the Falklands and South Georgia. First, military weakness is provocative. Argentina ramped up its aggressive rhetoric and diplomatic efforts to reclaim the Falklands only after P.M. Cameron announced massive cuts to the Royal Navy and British ground forces. The decommissioning last December of the U.K.’s sole remaining aircraft carrier, Ark Royal, well before its service life ended, and the sale of Britain’s 50 G-9 Sea Harrier fighter jets to the U.S. Marine Corps, seems to have emboldened the Argentines. In 1982, the Royal Navy had approximately 90 warships from which it could assemble a task force. Today it has 30. Indeed, most experts believe that while it would be very difficult for the Argentine military to successfully invade the islands, it would be nearly impossible for the U.K. to retake them without an aircraft carrier in the event that Argentina was successful in overrunning Britain’s key air base at Mount Pleasant. There’s a clear analogy between Argentina’s response to the U.K.’s defense cuts and what we can expect in the South China Sea and Persian Gulf from China and Iran, respectively, as massive sequestration cuts threaten to decimate the United States military. Indeed, the Obama administration announced this week that the U.S. Navy will decommission 7 Ticonderoga class cruisers and 2 amphibious warships in 2012 alone. There’s no doubt that Beijing, Tehran and even Moscow are watching the slashing of the U.S. defense budget with the same attention that Buenos Aires is paying to the decline of the Royal Navy.